Henry Dearborn was born in Hampton, New Hampshire, on 23 February 1751. He studied medicine under Dr. Hall Jackson in Portsmouth and then married Mary Bartlett in 1771. Dearborn joined the military early in the Revolution and saw action at Bunker Hill. He served under Benedict Arnold in Quebec, was captured and then paroled in 1776. As a major, he fought at Ticonderoga and Freeman’s Farm with the 1st New Hampshire Regiment. He spent the winter of 1777-1778 at Valley Forge, and later fought at Monmouth, against the Six Nations, and at Yorktown. 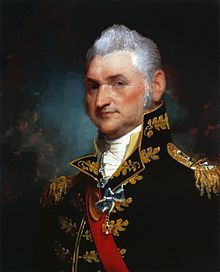 In the succeeding years, he returned to Maine, became a major general of militia there, was appointed U.S. marshal for the district of Maine, served in the U.S. House of Representatives, served as Secretary of War and helped plan the removal of the Indians to the west of the Mississippi River. From 27 January 1812 to 15 June 1815, Dearborn was the senior officer in the Army. He fought unspectacularly against the British in the northeast theater in the War of 1812. He then went to command New York, and soon left active service. In later life, he was the ambassador to Portugal from 1822 to 1824. He died at Roxbury, Massachusetts, on 6 June 1829.